Jude studied at Loughborough University and graduated with a BA (hons) in Printed Textiles, after which she won a placement to work in textile design with ‘Dorma’. 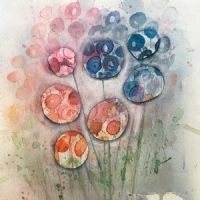 She now works from her Belfast Studio, where she creates colourful contemporary artwork based on her garden views and the many places she visits around Ireland. She works mainly in watercolour and likes to give the paint freedom of movement bringing energy to her work.